My search for answers as to how Sarah Goldfarb was related to my grandmother’s family had thus far led me to conflicting evidence. Three of her children had listed her birth name as a version of Brotman on their marriage records, and the death record of her daughter Gussie also listed Sarah’s birth name as Brotman. Brotman, of course, was my great-grandfather Joseph’s surname. Two records, however, indicated that her birth name might have been Brod. 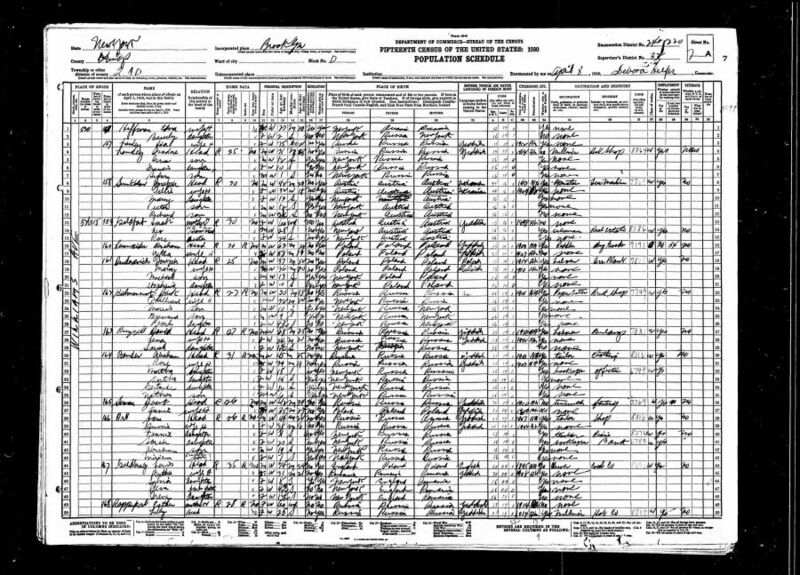 The birth record of her daughter Rosie in 1902 indicated that her birth name was something different—Braud, which appeared to be a phonetic equivalent to Brod. Brod or Brot was what I believed was the birth name of my great-grandmother Bessie. 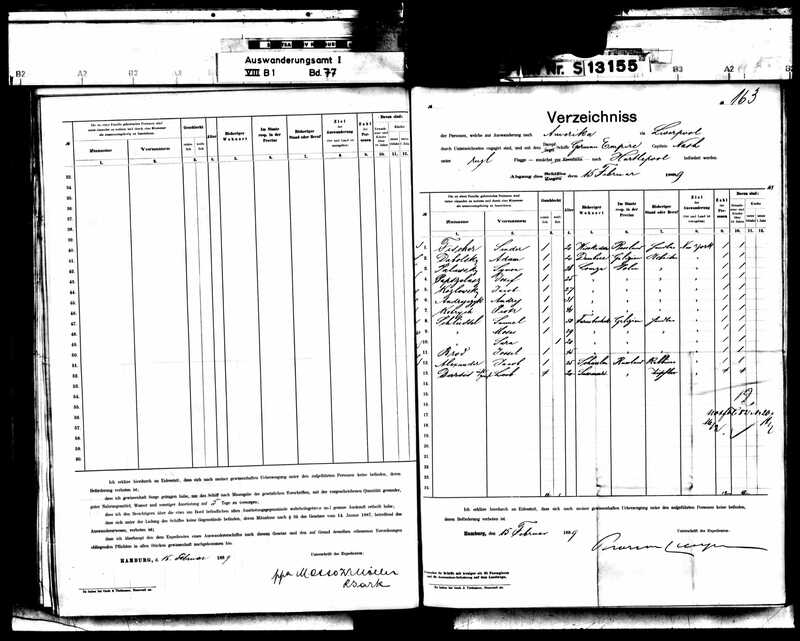 And the marriage record of Sarah’s son Morris in 1919 reported Sarah’s birth name to have been Brod. So was Sarah a sister of Joseph or a sister of Bessie? Since she had named one child Bessie and one Joseph, the naming patterns weren’t helpful and were in fact bewildering. Was neither Joseph nor Bessie her sibling? And their residences in the US also presented confusing evidence. Sarah first had lived near the Brotmans, who settled in Pittsgrove, New Jersey; then she and Sam had moved across the street from my great-grandmother Bessie after Joseph Brotman died in 1901. Had Sarah moved to help her sister? Or her sister-in-law? Nothing was definitive. As I indicated in my last post, a great-grandchild of Sam and Sarah Goldfarb, my cousin Sue, sent me extensive family history notes that someone in her extended family had compiled back in the 1980s. I will refer to these materials as the “Goldfarb family research.” There were no original documents in these papers, but rather handwritten charts and notes that someone had recorded based on the research he or she had done. I scoured those notes looking for additional clues. Most of the information about Sam and Sarah Goldfarb confirmed what I’d already found. There was also a lot of information about Sam Goldfarb’s siblings and their families and descendants. Although these were not my genetic relatives, I nevertheless added them to my family tree and looked at the notes carefully, thinking that this information might also lead me to clues about my own relatives. 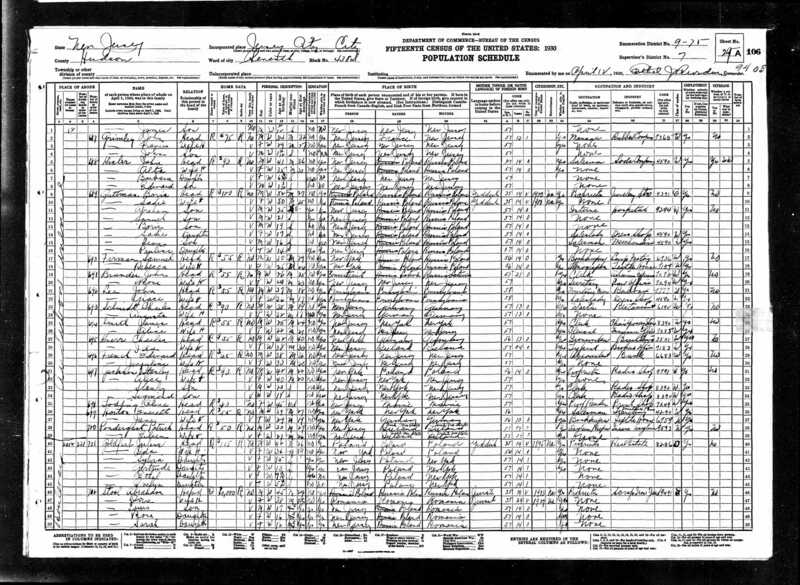 Most importantly, the genealogist who compiled the Goldfarb family research agreed with my conclusion that the Sam and Sarah had come from Grebow, Poland, the same town I had visited in 2015 and the town that my great-uncles David and Abraham Brotman had listed as their home on their ship manifest in 1889. That was reassuring. Perhaps the most useful part of the Goldfarb family research were the notes that reflected more recent marriages and births and deaths than I had yet located and the names of descendants and their spouses. For example, although I had been able to find information that indicated that Joseph Goldfarb, Sam and Sarah’s fifth child, had married a woman named Rebecca “Betty” Amer, I did not know when or where they had married. 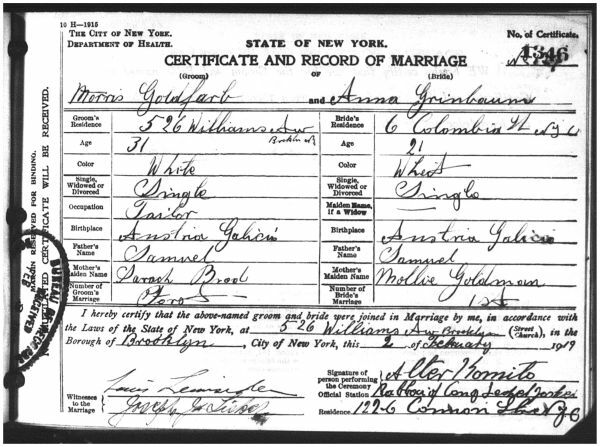 According to the Goldfarb family research, Joe and Betty had married on September 17, 1922, in Brooklyn. But I cannot find any entry in the NYC marriage index on either Ancestry or FamilySearch or through Steve Morse’s website to confirm that. Since their first child Marvin was born in Jersey City, New Jersey, in 1923, I thought that perhaps Joe and Betty had married in New Jersey, not Brooklyn. I asked my researcher in New Jersey whether she could find a marriage record for them in New Jersey, but after a diligent search, she was unable to find a marriage record there either. Perhaps Joe and Betty never filed a marriage certificate? Meanwhile, I continued searching for the Goldfarbs going forward from 1920 where I’d left off. In 1925, Sam and Sarah were still living on Williams Avenue in Brooklyn with their daughter Rose, who was now 22. Sam (listed here as Solomon) was no longer working. Living at the same address were Sam and Sarah’s son Morris and his family; Morris was a grocery store owner. In 1925, Julius and Ida Goldfarb were living in Jersey City, according to the Jersey City directory for that year. Listed right above Julius is a Joseph Goldfarb, and listed right below him is a Leo Goldfarb. 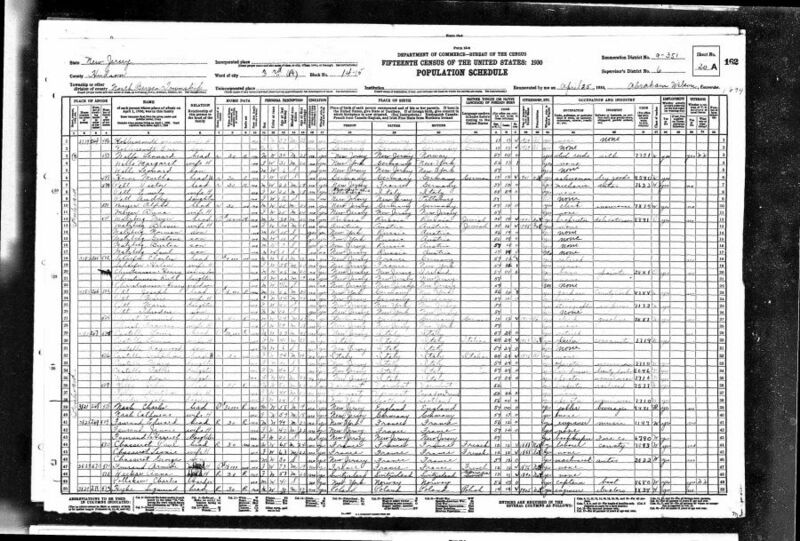 Although I could not be sure, I assumed that these were Julius’ brothers Joe and Leo (especially since Leo was not living with his parents in Brooklyn according to the 1925 NY census). That was then confirmed when I searched for their sister Bessie (Goldfarb) and her husband Meyer Malzberg. 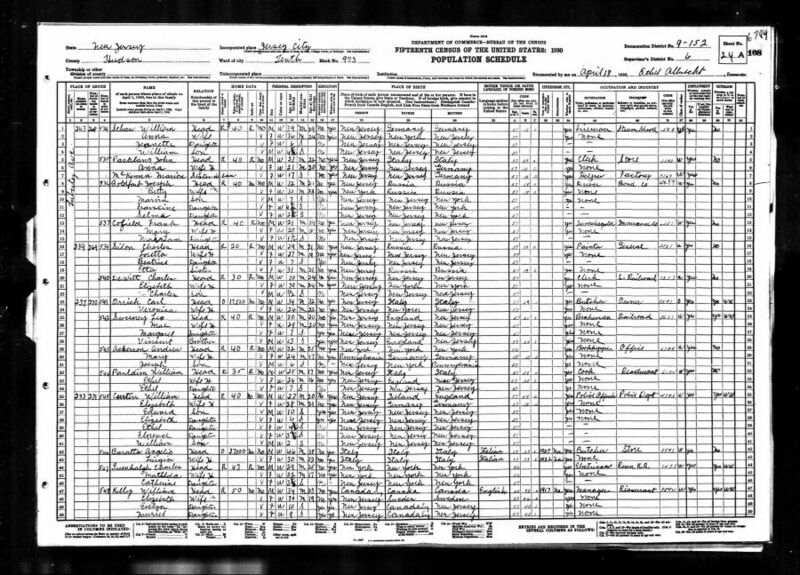 I had not been able to find them on the 1920 US census nor on the 1925 NY census, but when I saw that their child Burton was born in 1923 in Jersey City, I decided to check that 1925 Jersey City directory for the Malzberg family. Sure enough, there they were living at 247 Montgomery Street in Jersey City, the same address listed for Leo Goldfarb. So in 1925, four of Sam and Sarah’s six surviving children were living in Jersey City; only Rose and Morris were still living in Brooklyn. Sam had died from heart disease. His father’s name was Julius; obviously, Sam and Sarah had named their firstborn son for Sam’s father. But the one item that made me stop when I obtained this record was Sam’s birthplace: “Tarnobjek, Austria.” I knew this must have been Tarnobrzeg—the very town I had visited in 2015, the place also known as Dzikow, the place I had long assumed was the home of my great-grandparents, Bessie Brod and Joseph Brotman, and that is only a few miles from Grebow. Here was one more piece of the puzzle helping me corroborate that Tarnobrzeg and its immediate environs was where my great-grandparents had lived before emigrating from Galicia. After Sam died, Sarah continued to live on Williams Avenue with her daughter Rose, and by 1930 her son Leo had moved back there as well. He was working as real estate salesman. Morris was also still living on Williams Avenue, though now in a different building down the block; he was still the owner of a grocery store. Julius and Joe Goldfarb and their families were still living in Jersey City in 1930; Julius was the owner of a real estate business, and Joe was working as a salesman for a biscuit company. Bessie was also living in New Jersey in North Bergen where her husband Meyer Malzberg owned a delicatessen. 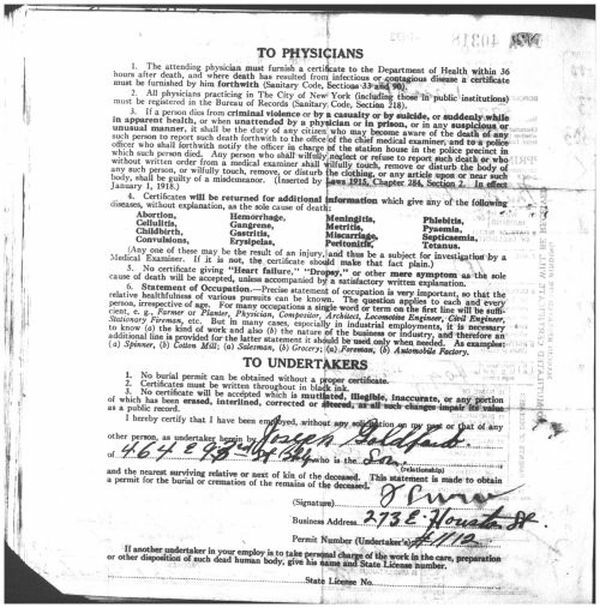 Her son Joseph, the informant on the death certificate, reported that Sarah, who died from hypertension complicated by diabetes, was the daughter of Joseph Brod and Gittel Schwartz. I stared at this record for many minutes. This was a huge revelation. Joseph is the same name listed on my great-grandmother Bessie’s death certificate as the name of her father. That certificate had named her mother as Bessie Broat, but I was and remain convinced that the informant, Bessie’s bereaved second husband Philip Moskowitz, was confused and thought he’d been asked for Bessie’s maiden name, not her mother’s maiden name. Notice also that Bessie, like Sarah, suffered from diabetes. 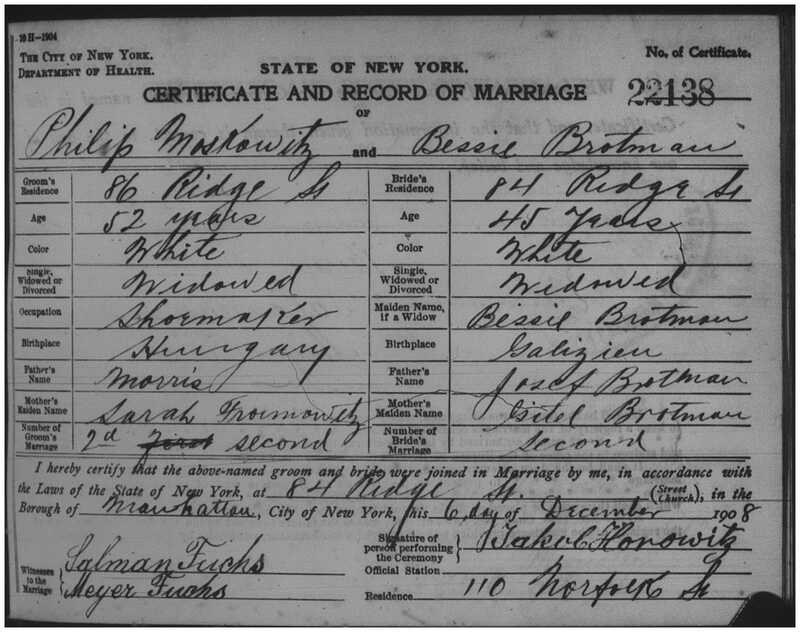 In addition, on Bessie’s marriage certificate from her marriage to Philip, she had given her father’s name as Josef Brotman and her mother’s as Gitel Brotman. Things were starting to make more sense—to some degree. It was starting to look like Sarah Goldfarb was my great-grandmother’s sister, not my great-grandfather’s sister. Sarah and Bessie both had parents named Joseph and Gittel. They both had suffered from diabetes. They both had daughters named Gussie or Gittel. The naming patterns are fascinating. In Eastern Europe, Ashkenazi Jews followed certain traditions in naming their children. First, a child was to be named for a deceased relative, not a living relative. Second, although there were no strict rules, generally children were named for the closest deceased relative—a parent, grandparent, sibling, aunt, uncle, and so on. Sam and Sarah named their first son Julius for Sam’s father; their second son Morris was not named for Sarah’s father Joseph, suggesting that Joseph Brod was still alive when Morris was born. But when her third son was born in 1897, she did name him Joseph, presumably for her father, who must have by that time died. That would mean that my presumed great-great-grandfather Joseph Brod died between 1886 and 1897. The same rules would generally apply to the naming of daughters. Sam and Sarah named their first daughter Gittel, presumably for Sarah and Bessie’s mother Gittel Schwartz Brod. 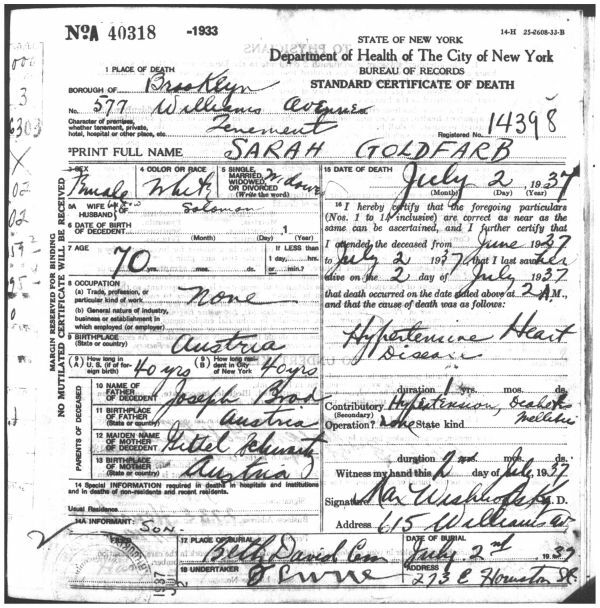 Gittel (Gussie) Goldfarb was born in 1890, suggesting that Sarah and Bessie’s mother was deceased by then. My great-grandmother Bessie named her first daughter Tillie in 1884, which might indicate that her mother Gittel was still alive. But when she had my grandmother in 1895, her second daughter, she named her Gittel, presumably for her mother. 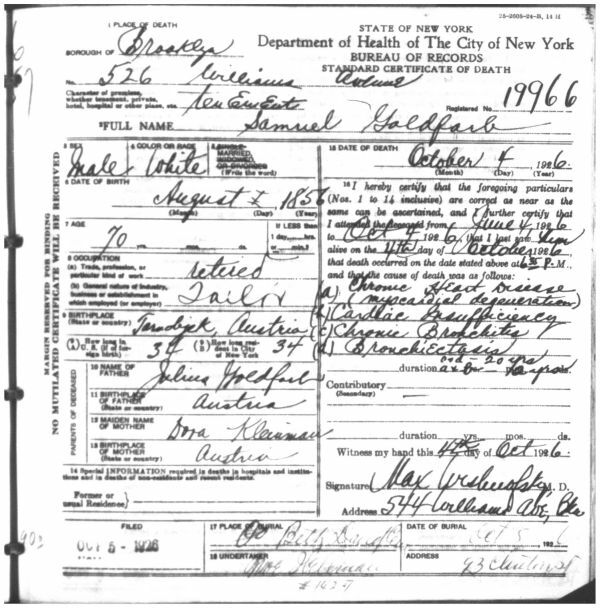 Thus, Gittel Schwartz, my presumed great-great-grandmother, must have died between 1884 when Tillie was born and 1890 when Gittel Goldfarb was born. So at first I thought I had solved the mystery and thought that Sarah had to have been Bessie’s sister. But then things started getting murky again. Why did some records refer to Sarah’s birth name as Brotman, some as Brod? 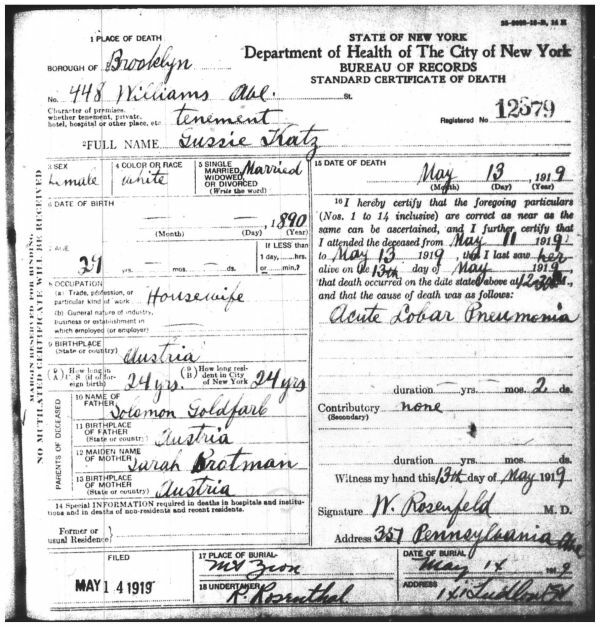 Why did records sometimes refer to Bessie’s birth name as Brot or Brod, sometimes as Brotman? What the heck did this all mean? Were these really two versions of the same name? And then I recalled that the ship manifest that I had assumed was possibly the one listing my great-grandfather used the name Yossel Brod. I wasn’t sure this was in fact my great-grandfather, but if it was, why was he using the name Brod, not Brotman? I know that family lore says that my great-grandparents, Joseph Brotman and Bessie Brod, were cousins. I know also that sometimes children in Eastern Europe used their mother’s names as surnames, not their father’s names. Could Joseph Brotman, my great-grandfather, have been the son of a woman named Brod who was a sibling of the Joseph Brod who fathered Sarah and Bessie? Or was it the other way around? 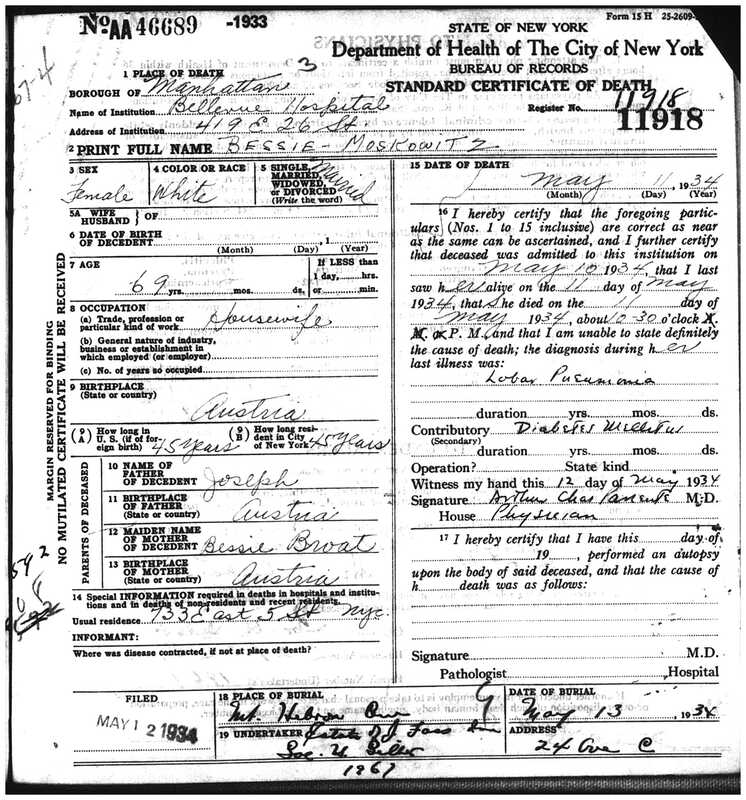 I have no record for Joseph Brotman’s mother’s name aside from the reference on his death certificate to “Yetta.” Moses Brotman’s death certificate lists his mother as Sadie Burstein. Neither helps me here at all. And I’ve no idea how accurate either is anyway. Unfortunately, the Goldfarb family research papers did not shed any further light on this question either, but merely contained the same information I’d found on the actual records about Sam and Sarah. What am I to make of this? I have asked one of the Goldfarb descendants to take a DNA test, but given my experiences with DNA testing, I don’t hold out hope for much clarity from the results. But it’s worth a try. If anyone else has any ideas or reactions, please let me know your thoughts. The big question remains: was Sarah Brot(man) Goldfarb a sibling of my great-grandmother Bessie? Or a sibling of my great-grandfather Joseph? What do you think? And perhaps even more importantly, are Brod/Brot/Brodman/Brothman/Brotman all really the same surname? But the story continues when I turned to the question of … who was Taube Hecht? And it gets even better. 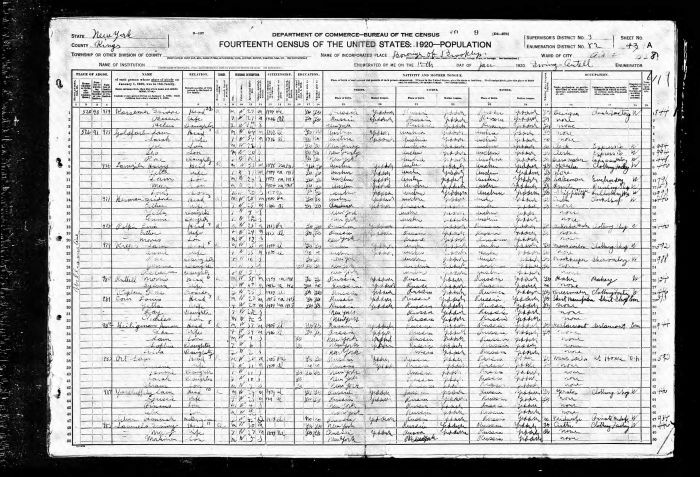 This entry was posted in Brotmans, Galicia/Poland, Genealogy, Lower East Side, New York and tagged brod, brotman, goldfarb, Jersey City, New Jersey, New York by Amy. Bookmark the permalink. Thank you, Cathy. I hope I am not really being confusing. I certainly am confused by the facts, but I hope my writing isn’t making it worse! What do you make of the fact that the records have two different surnames for Sarah and for Bessie? Do you think they are the same name? Thanks! No, I love all the questions you ask. It shows that you aren’t throwing it all together just to be done with it. Since I don’t have experience with Eastern European families I can’t say yes or no to your question about the possibility of Brod and Brotman being synonymous for the family name. If it is, you will have to be very careful going back further. Good luck with the cousin’s DNA. I just don’t know what to think. I can say I am very happy I have not run into a problem like this in my own family research. Also I am not sure what a DNA test will really show for this question. However I do believe that DNA testing can be of great help in general. I wish I had older relatives to take DNA test but alas I am the oldest in my family. I have made some advances in my research because of DNA testing. Amy, you’ve made a lot of progress on this mystery. The clue about the town is very telling and resonated with me. Interesting what you say about the Ashkenazy naming pattern. Isn’t it true, though, that because it’s the Hebrew name that is replicated, that the secular first name many times just picks up the first initial, etc.? Well, it wasn’t coincidence! I visited last year (2015) because I was pretty sure that that was where my great-grandparents had lived. Now I am even more certain! And it’s actually in Poland—before World War I it was part of the Austria-Hungary Empire, so my great-grandparents and others said they were from Austria. Thanks, Karen! Hi Amy, I can understand how frustrating the Brod-Brotman situation is for you, I hope you will make some advancement, and that things will become clearer. Thank you, Shirley! I will keep plugging away. It seems to me that they were first cousins who married. And there is a double relationship with both your great grandparents. Good luck. There is so much intermarriage it gets very confusing. My great grandparents (my maternal grandfather’s parents) were first cousins. It happened a lot!! You may already know this but…. When I ordered the marriage record for my parents in Fresno, where I KNEW they were married, I was told there was no record found. Since my mom was still living I asked her about it and after a few minutes of silence while she thought it through, she remembered that they had gotten their marriage license in San Mateo County since they were both going to college at Stanford (San Mateo County). Sure enough, I found them there! Not sure if that helps at all but just a thought. So glad you had the opportunity to ask her. Unfortunately there doesn’t appear to be anyone left to ask these questions, but I will keep searching. Born 1893. His mother is a mystery to me as older family members said that Brothman is not our real last name. Some say his mother’s name was sara. Who remarried my grandfather had 2 half brothers sol and morris I believe not sure. I had heard three different last names. Brothman, brokosky, Rosenberg. The brokosky name might have been my grandfather’s name also said maybe jules brokosky. A lot of these names come up in your post. Just curious sara was also from Austria as I was told. My grandfather history starts in 1911 when he joins the military. 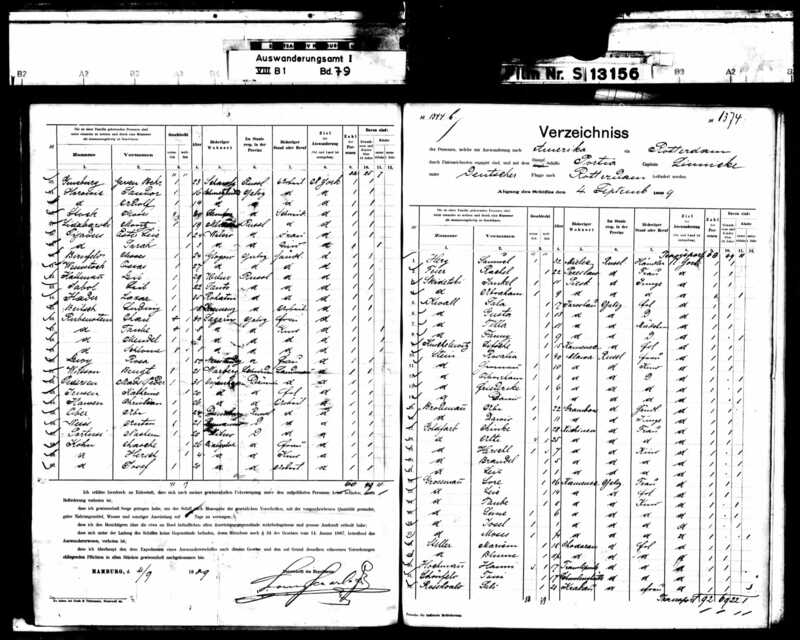 Before that there are no records.his census say he was born in phila pa, he stated that his parents were too but my father said she was from Austria. My father and aunt’s aren’t around anymore don’t know the real truth. Any ideas? Somthing keeps drawing me back here. Thanks, love your determination. Hi Nick—thanks for reading and commenting. Let me email you to see if I can help.